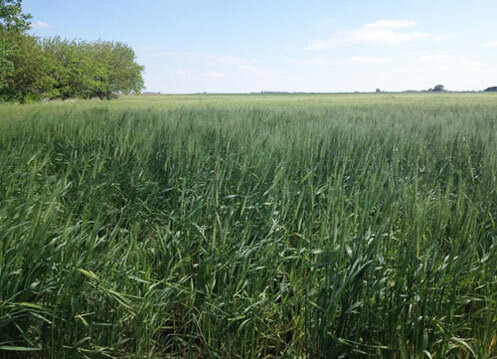 Hail and heavy winds damaged wheat fields in central, south central, and eastern Nebraska this week. 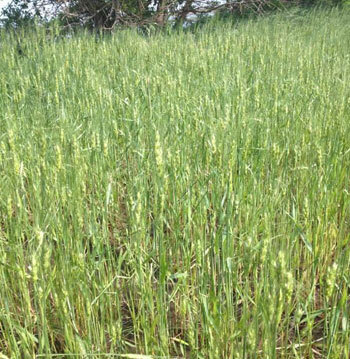 Wheat was in flowering to beginning milk stages. To assess hail damage to winter wheat, the standard is to count the damaged stems or heads, if possible, in one foot of row in several places to get the average number of stems or heads damaged. Using a 12-inch plant spacing, there are 43,560 feet of row in an acre. The average wheat head has about 22 kernels. Therefore, one damaged stem or head per row-foot equals 43,560 x 22 = 958,320 seeds per acre. If we use a seed weight of 15,972 seeds per pound and divide the estimated total seed loss per acre by seeds per pound (958,320 divided by 15,972), it equals 60 pounds or 1 bushel per acre in 12-inch rows. In 10-inch rows there would be a 1.2 bushel per acre loss for every stem or head damaged and with 7.5-inch rows, a 1.6 bushel per acre loss. A harvest treatment aid may be necessary in some fields where the canopy was opened up, giving weeds an advantage. Producers will also want to be prepared to apply herbicide treatments after harvest. Broadleaf weeds cut off by the combine platform will need to recover and produce new foliage before they can be controlled.